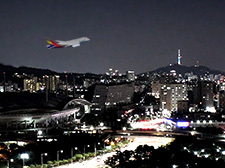 News from South Korea regarding an Asiana Airlines flight attendant indicates that the Seoul Eastern District Court has ordered her to pay a passenger 109.6 million won that's about £74,181 for burns from instant noodle soup. The flight attendant had accidentally spilt the soup onto the female passenger, and as a result, the passenger suffered second and third-degree burns from her lower abdomen, thigh and genital area, local media is reporting. The court heard that the passenger, Ms Chang, was travelling from Incheon to Paris in business class on 17th March 2014, she filed the lawsuit a year later demanding at least two million won for damages. Ms Chang complained that the airline did not have emergency supplies to handle burns on the aircraft and she had to rely on ointment, a bag of ice and some pain relief tablets until her arrival in Paris. Ms Chang had worked occasionally as a fashion model prior to the incident and as part of her legal action asserted that it would be difficult for her to fully recover even if she underwent skin grafts for the next 10 years. She also says that leading a 'normal' marital life would be potentially difficult due to the burns on her private parts. As part of its defence, Asiana Airlines said the incident occurred because Ms Chang had knocked the tray carrying the instant noodle. The carrier also advised it has provided Ms Chang with emergency medical attention following instructions from a doctor on the flight. The Seoul Eastern District Court has ruled in favour of Ms Chang and ordered the airline to pay her 109.6 million won in damages.